Magnolia Ice Cream introduces three new flavors in their "Kakaibang Sarap ng Pinoy Favorites" collection. Quezo Mangosteen, a creamy combination of buttery cheese and mangosteen fudge for a tangy, sweet and salty flavor. Ube Salted Caramel Waffle, a blend of vibrant ube halaya with luscious salted caramel ripple and crushed crunchy waffle cones. My personal favorite since I love ube halaya and they've combined sweet and salty taste in one. Mango Toffee Nut, a classic mango ice cream mixed with generous amount of toffee-coated peanuts for a crunchy texture and swirled with rich toffee ripple. So what are you waiting for? 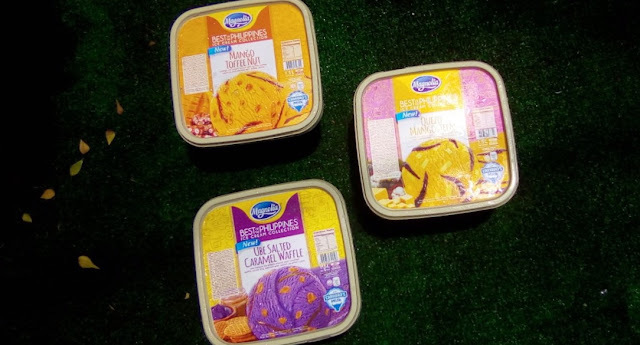 Head to your nearest supermarkets or groceries and purchase these yummy frozen treats and dont forget their other flavors: Avocado Macchiato, Taro White Cheese, Mango Dark Chocolate, Tablea Yema and Ube Keso. Share a post of your most memorable summer ice cream eating experience on Instagram between April 10 and 21 for a chance to win a treat from us!